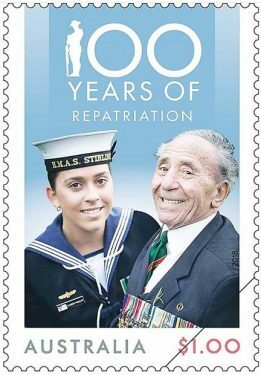 A CHARMING photograph of a Mt Martha grandfather and his granddaughter marching in the Mornington Anzac Day parade last year has been chosen as the 100 Years of Repatriation stamp. And recognition of the photographs’s quality and relevance to the theme has given Mornington amateur photographer Peta Heffernan one of the greatest thrills of her life and created a bond between them that will last a lifetime. 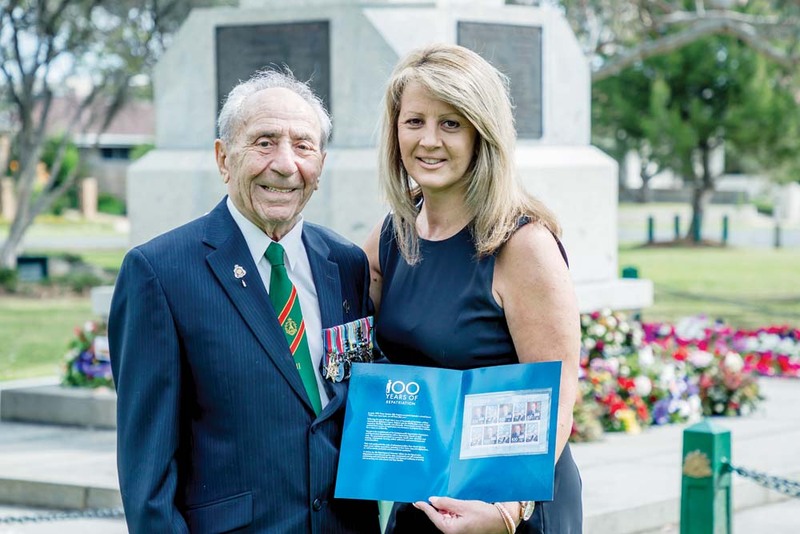 Her picture of decorated veteran Major Alec Weaver, 98, and Able Seaman Liz McCallum, taken in Main Street, was released nation-wide last month as an Australia Post stamp and postcard representing 100 years of Repatriation. The issue of repatriation was raised at the end of World War I when Australian Prime Minister Billy Hughes promised that all surviving servicemen would be brought home and cared for. That centenary milestone came as we commemorated the 100th anniversary of the end of the Great War on 11 November. Ms Heffernan’s picture was first published in the Navy News last year but its significance was recognised by the Department of Veterans Affairs who saw it on Ms Heffernan’s social media. They liaised with her and Australia Post to create the stamp and the image is now part of history. “It’s been one of my proudest moments as a photographer,” said Ms Heffernan, who admits it is a “very expensive hobby”. It is not hard to see why: Major Weaver’s wartime exploits are the stuff of legend. Born in Germany he was a member of the Hitler Youth. Visiting Australia at the outbreak of World War II he joined Australian mates who were enlisting in the AIF and saw service in New Guinea. Despite harrowing ordeals and official queries on his bona fides, he obtained Australian citizenship and later served in Vietnam and Korea, where he was wounded and honoured for his gallantry. Fluent in German and Japanese he later joined ASIO and served as a spy for 15 years before teaching Japanese at a Mornington school. Ms Heffernan said she inherited a love of the craft through her mother, Marita, who was a wedding photographer in Mornington for many years before passing away 14 years ago. Another passion is photographing water fun for members of the Disabled Surfers’ Association, which often visits Pt Leo.